This entry was posted in the process of death, Uncategorized. Bookmark the permalink. Hi Chelsea! As a fellow hopeful scientist, I appreciated your topic choice and approach for this blog post. 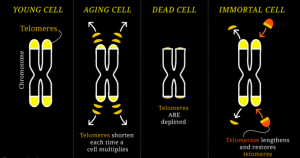 You did an excellent job explaining telomeres in a comprehensible way for our peers that aren’t necessarily as nerdy about biology as we are. On a side note, if you haven’t read The Immortal Life of Henrietta Lacks by Rebecca Skloot then I urge you to look into it! It’s a great nonfiction read about the first immortal cell line that jump-started ageing research, as well as a separate discussion of ethics and all kinds of issues with patient consent. Anyway, I loved how you started your blog post talking about our societal obsession with immortality and referenced back to it to connect the bio lesson with your main argument. You made great points as to the implications global immortality could have. Something that came to mind as I read your piece was the likely problem (at least at first) with this technology only being available to the rich and powerful, resulting in a further divide in our society. 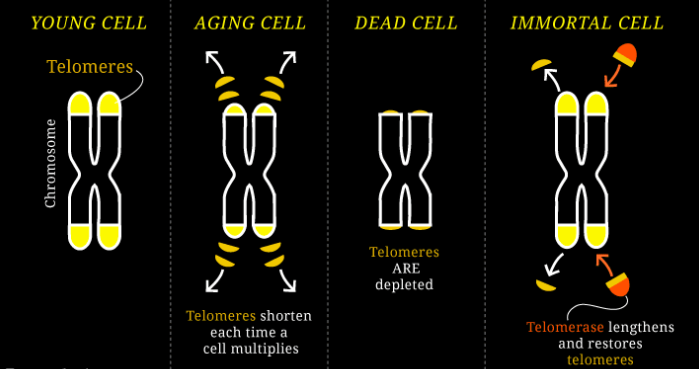 Additionally, it’s interesting to think about how people’s answers to the question “would you want to live forever?” change if it meant immortality at age 85 versus say 30. All things considered, your blog post was extremely well done and thought-provoking!